The culturally and architecturally rich Brazilian city of Sao Paulo has attracted our attention today with Campo Belo, a gorgeous residence which combines modernism and traditional touches in a unique way. Lavish use of wood, bricks and indoor greenery make the home a stylish yet earthy and refreshing place to live in. The colour palette ranges from soft and elegant to bold and cheerful as we go from room to room, while cozy textures promise sensual delight. 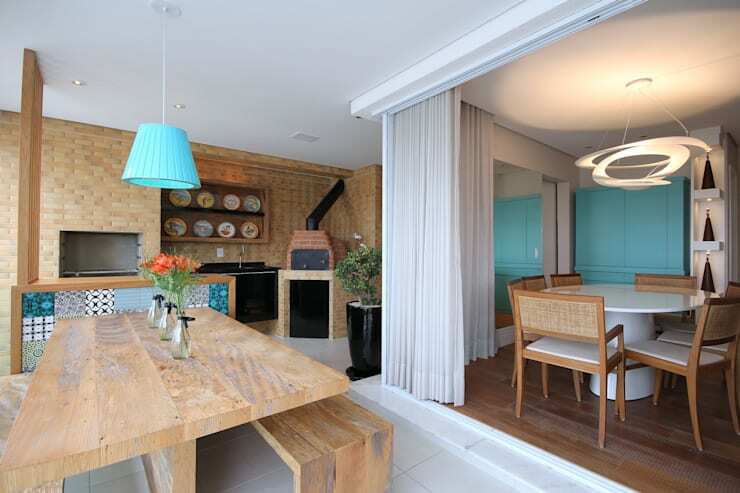 Pretty patterns and smart storage solutions also add to the appeal of this house designed by the architects at Meyercortez Arquitetura & Design. Let’s begin our tour with the stylishly rustic and inviting patio, encased in glass and soft white drapes. 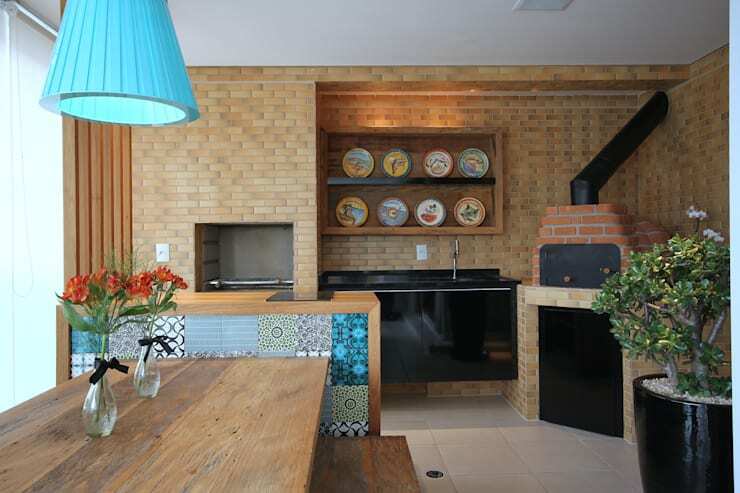 Sleek bricks, wood and colourful mosaic tiles make the outdoor kitchen a gorgeous affair. An old-fashioned wood fire oven and pretty decorative plates in the wall shelf add lots of charm here. 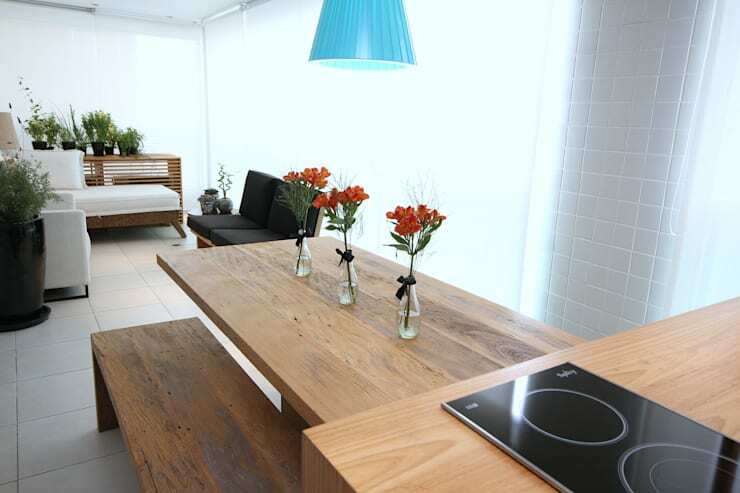 A wooden dining arrangement projects from the kitchen counter so that you can enjoy meals on the patio itself. A cosy black and white seating arrangement surrounded by lush potted plants allows you to relax as well, while large glass windows allow sunlight to flood this area. Sliding glass doors shaded with white flowing drapes open up to take you inside the home and integrate the patio with the interiors when required. A gleaming white round table surrounded by slightly traditional chairs make for attractive mealtimes under the chic chandelier. 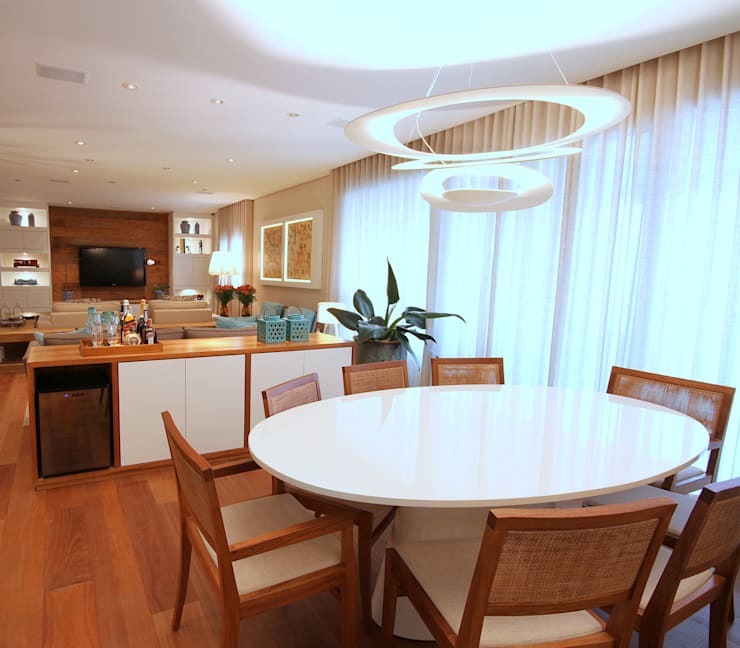 You can also make out how the house follows an open plan layout with the dining and living areas merging seamlessly. Fashionable and plush seating arrangements mark both the living as well as entertainment space, while flowers and potted greens add freshness. 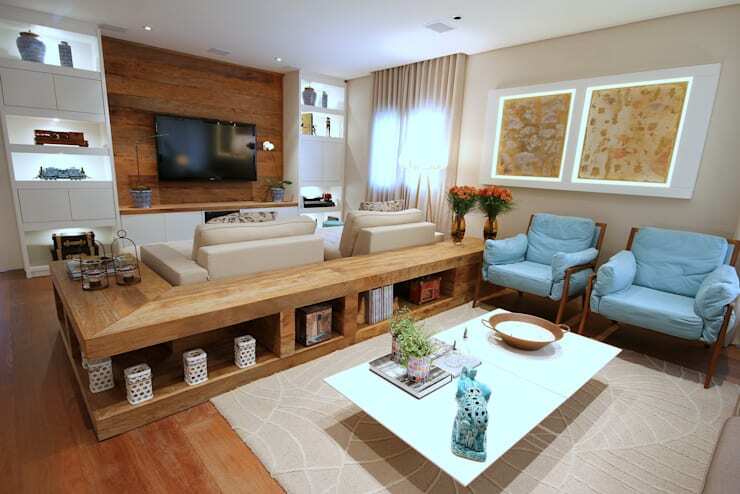 The wooden floor and TV panel add warmth here, while decorative knickknacks make aesthetic appearances. Storage solutions come in the form of shelving units flanking the TV and a wraparound shelf which hugs the creamy loungers closely. 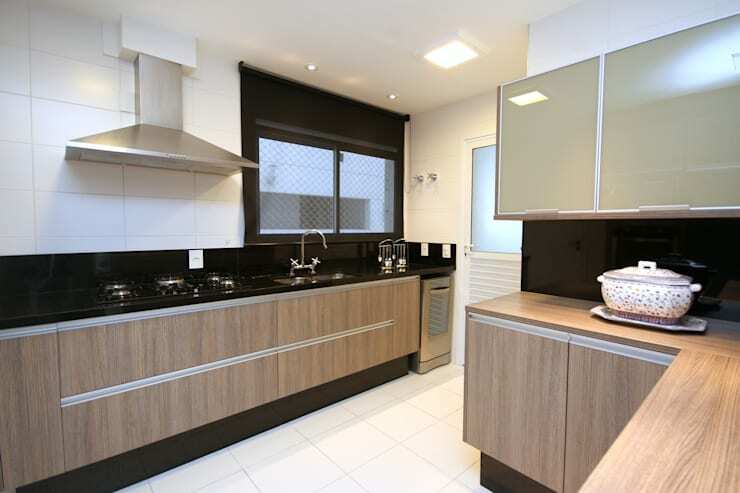 Black, white and light wooden hues come together in this smart modular kitchen lined with sleek cabinets and trendy appliances. Ample provisions have been made for both natural and artificial lighting. 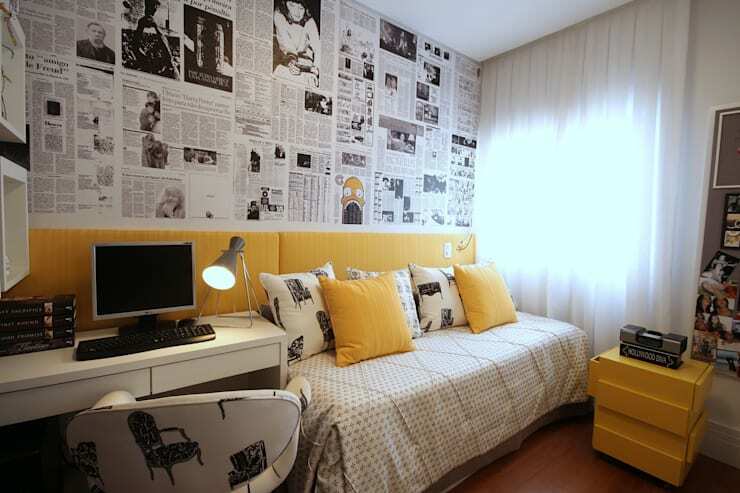 Dashes of sunny yellow, newspaper wall art, and quirky patterns on the cushions make the playroom cheerful, intriguing and cosy. A sleek study desk and a playful drawer add to the playful ambiance here. 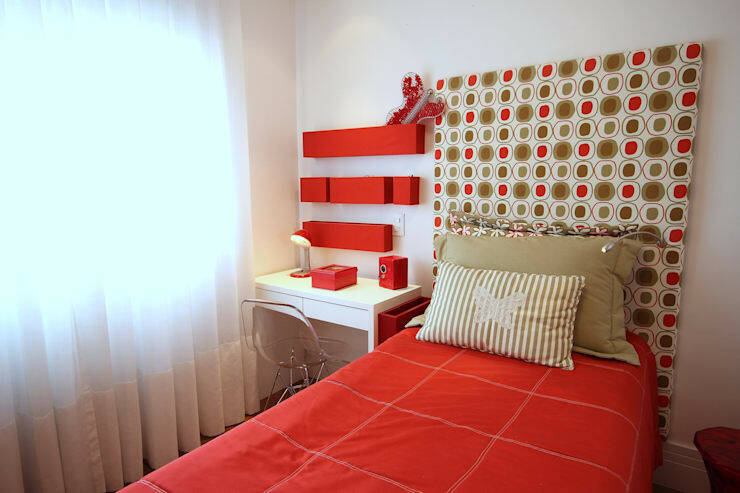 Splashes of bold red bring this compact but cosy kid’s bedroom alive. The patterned headboard, quirky shelves above the study desk, and the acrylic transparent chair make for added attractions. 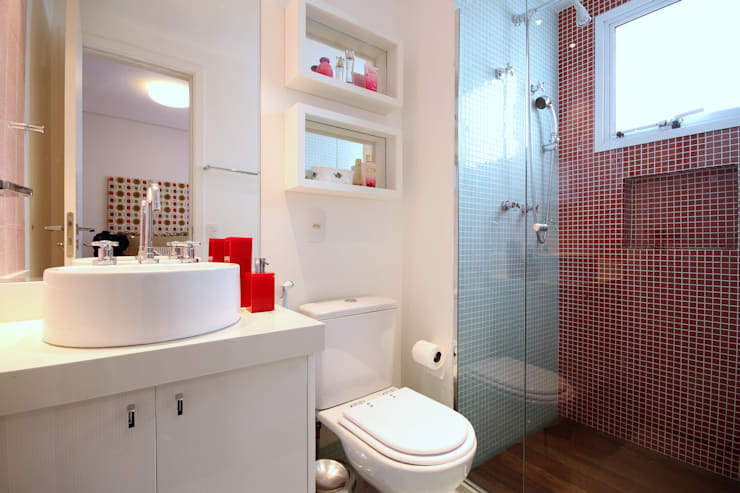 Red mosaic tiles in the shower nook add pizzazz to the white environment of the kid’s bathroom. Sleek niches and a sink cabinet help in organising toiletries, and stylish fixtures and bright lights make this a welcoming space. 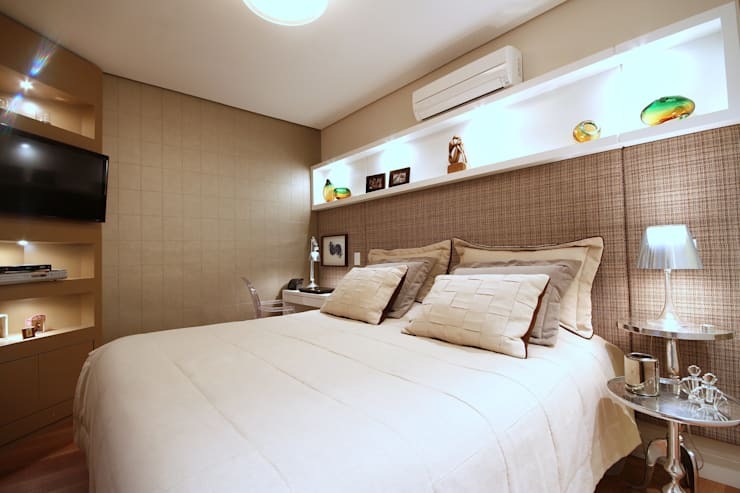 Soft shades of cream, beige and white lend the master bedroom a relaxing and cosy atmosphere. Sleek shelves and niches help in storing and displaying stuff, while stylish lamps and side tables add to the visual appeal. 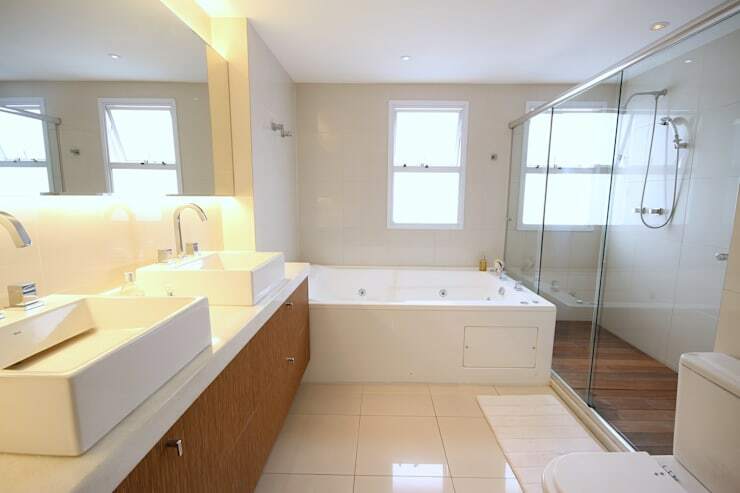 The spacious master bathroom uses the white hue lavishly for a pure, calm and clean look and feel. Modish sanitary wares add to the style quotient here, while wooden elements add warmth. Awed by this gorgeous Brazilian home? Take another tour for more ideas - This Grand Home Makes A Powerful Style Statement.